I had announced on the last grocery list that I had taken a pasta salad with me to the graduation BBQ along with a million other dishes. This is not that pasta salad. This is better. That pasta salad is what happened when my brain looked like a giant bowl of malt o meal aka brain fart aka how can I sleep but make it look lm still awake? solution: paint eyes on my eyelids, no wait, glue googly eyes on there. I remade the salad and kept it to just three fillings, equal parts of each and it turned out great. I know this is a day late and a dollar short for Memorial Day, but I don’t want to live in a world where there’s only one BBQ for summer. Make it happen, then make this salad. 3 different add ins, 1 1/2 c of each. I used olives, halved, quartered artichoke hearts, halved, and cherry tomatoes, quartered. The possibilities are really endless, you could do anything from cannelini beans to broccoli to carrots to raw zucchini to mozzarella to peas. Just do 3 equal 1 1/2 c parts. On top of that you could toss in about a 1/3 c toasted pine nuts or pumpkin seeds or sliced almonds. Do your thang. To make the salad, boil the pasta, drain, toss with a couple T of olive oil and let it cool to room temp. Toss in the rest of the ingredients and put in the fridge until chilled. Serve. I hear ya. I’m totally posting a fashionably late Memorial Day post in a couple days. 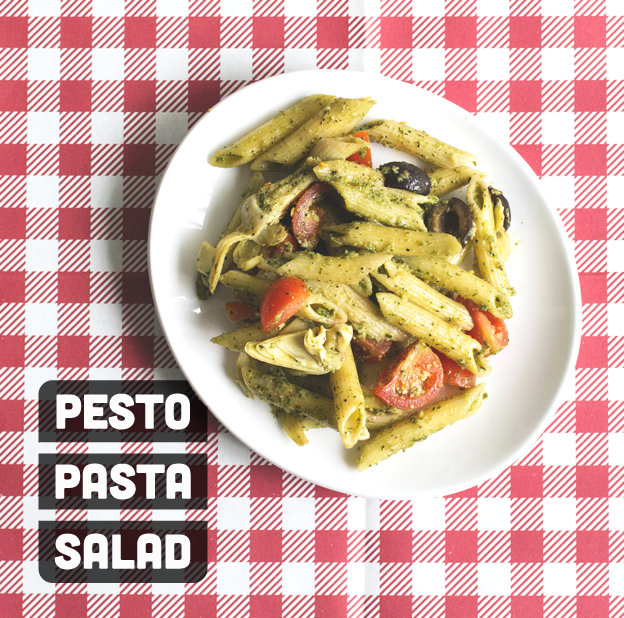 AND I love pesto pasta salads! In other news, I LOVE YOUR NEW SUMMER FABRIC. Sorry to shout, but I just effin’ love it, ya know? Gurl, shout away, you know I like a good print!! It’s actually a printed parchment paper from JoAnns! Super cheap and they have a bunch of colors. Cilantro cotija pesto sounds soooo good. The BBQ’s have just begun! This tasty recipe is just in time! It’s so fresh and so clean, clean! I want to be friends with that pesto. Just sayin’. It’s total friend making pesto. I try my best to include any housewife reference wherever I can, the love for it is greatly appreciated. All T All Shade! It’s a happy feeling factory pesto for sure. Looks so yummy! Definitely gonna try this.